Newly sworn in Defense Minister expresses support for “two-state solution” and Egypt's call for peace talks. Newly sworn in Defense Minister Avigdor Liberman was quick to announce on Monday evening that he supports the “two-state solution” to solve the Israeli-Palestinian Arab conflict. 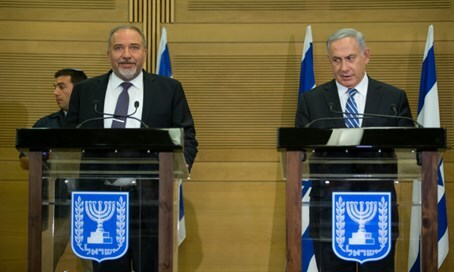 In a joint statement, Liberman and Prime Minister Binyamin Netanyahu expressed support for the recent call by Egyptian President Abdel Fattah al-Sisi for the sides to reach a peace agreement. “We welcome the recent speech of al-Sisi and his willingness to promote peace in the region,” added Netanyahu. But Israel has rejected the plan due to the fact that it calls for Israel to accept the so-called "right of return" for millions of descendants of Arabs who fled pre-state Israel, effectively bringing an end to the Jewish state.